A Thousand WordZ is an Ezine and a Community that is rapidly growing. We're started as a Benefit Organization and Music Collaborative and will eventually become an Ezine when our community grows stronger. We use a medium which allows artists to share their gifts and talents, arts and creativity, technical know-how and editorial knowledge with each other. We’re inviting you to join our communtiy and to submit your works for our future publication. We focus on Audio and Visual arts, which could be anything you do; short stories, essays, journalism, poetry, photography, paintings, drawings, song- lyrics, rap/hip-hop, rock, reggae, punk, spoken word, whatever… We are moving in a group and erecting something that is useful to us all. This is how it works: You read the theme of the upcoming issue. You send us your works. We configure the Ezine accordingly. We set up events to display our works. For your contributions to the Ezine we provide a link from our Network Section (Voltronnection) to either your webpage or email address. The Network Section will be open to the public and we will give snippets of recordings and a tour of our site. For more information please contact us at AThousandWordZ@hotmail.com or use the links above. Okay... after months of pulling it back together I am still determined and focused on uniting this beautiful idea of community. I want to feature people of our community our new blog. We...that's right...we...Francesca Cosentino has come from the other side of the computer to join in with the organizing of A Thousand WordZ. I feel supported in this effort. I give thanks to my community! This is something I am living for, so... come on! Let us do it! 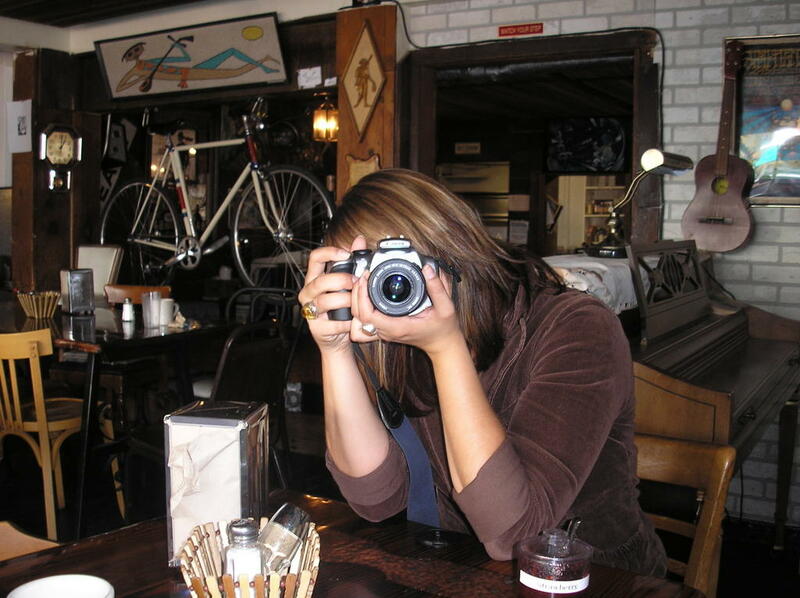 I need FotoZ, BioZ, InterviewZ, PaintingZ, MuziK, Research papers (students)... if you are creative...in any way...what iz it you want to give your creative kids of tomorrow? A better world!!! I am always frustrated when people don't share, yes like in kindergarten. Show and tell... You all remember that. We want to spread Community around the world. We are reaching out to everyone who knowz some one that knowz someone. We are all creative and sometimez that is all we have, our creativity. Whether it'z carpentry or painting, counseling or editing, teaching or landscaping, we are all creative. Let us tell the community your story...Someone should spread the news. Let us help. I wonder sometimes..."If I had no problem in the world, would I care about community as I do?" You know what... I don't honestly have an answer for that, but I'd hope so. If you are interested in our Ezine, we are working it out right now. The idea is to establish a network of people… cross - pollinate ourselves and share in the community of FRENDZ that are building a better world through expression and reciprocation. Join us and ask us how you can be a part of the Community. "Ask not what your community can do for you, ask what you can do for your community" -Atiim ...lol...a twist from JFK. I would like to know if we could call you Community. Quoting Andreas Smith, "BE the Change you want to See in the World". If you want to help, you can. Ask us how. I picked Francesca Cosentino up from downtown San Francisco, Ca. at 10am and we prepared ourselves for the event to perform and raise money for 'Families Helping Families on the Crossroads'. 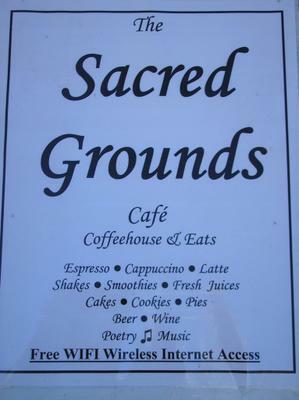 We spoke about expectations and dissapointment and decided to release expectations to enjoy our day and honor what we were doing at The Sacred Grounds Cafe this day. Flyers were sent out via the Internet from A Thousand WordZ and in the immediate community around the Cafe, but expectation seemed to linger in our hearts. I couldn't help but wonder what the turn out would be like and who would show up to support our cause, helping the hurricane victims, and how much we would make by the end of the day. Eventually I surrendered my concerns and Francesca set the pace by placing herself in the moment. I followed her lead. I pulled out my bag of lyrics and before performing, I shuffled through pages of poems, songs and rap lyrics that I piled together at home for the event. Once I gathered myself and my message, I began. I read poems written by David Whyte, William Butler Yeats, Mary Oliver and Dr. Scott Pengelly of Eugene, Oregon and, of course, my own pieces too. 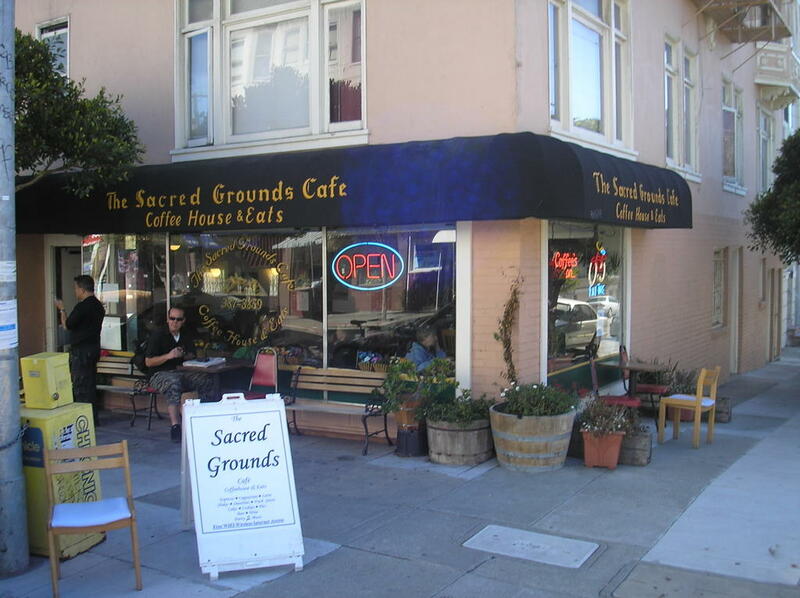 The patrons of The Sacred Grounds Cafe stopped to listen. They put their books, spoons, forks, computers, and expectations down to listen to poetry being delivered, almost to walk with me through the pictures I painted for them. 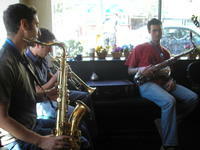 The tone of the cafe mellowed down to a simmer of appreciation before the music began. Elizabeth A. Reid strolled into the cafe, and with a smile, greeted the small crowd with music from her acoustic guitar and the beautiful lyrics she wrote and sang. She grabbed everyone present with her melodic voice and lyrics of love. Acoustic Guitar & Beautiful Song. "Elizabeth sang our heartz into feeling again and again and... Her voice and soulful lyricz touched everyone prezent with reflection and a sense of compassion. " 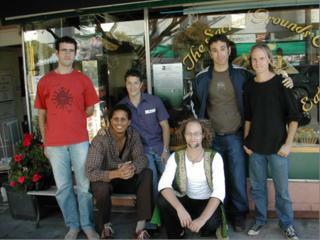 Elizabeth played her first West Coast Show with us at The Sacred Grounds Cafe this day. She just moved into California from Ohio and chose to begin her career in the West with a benefit to support the Hurricane Relief. 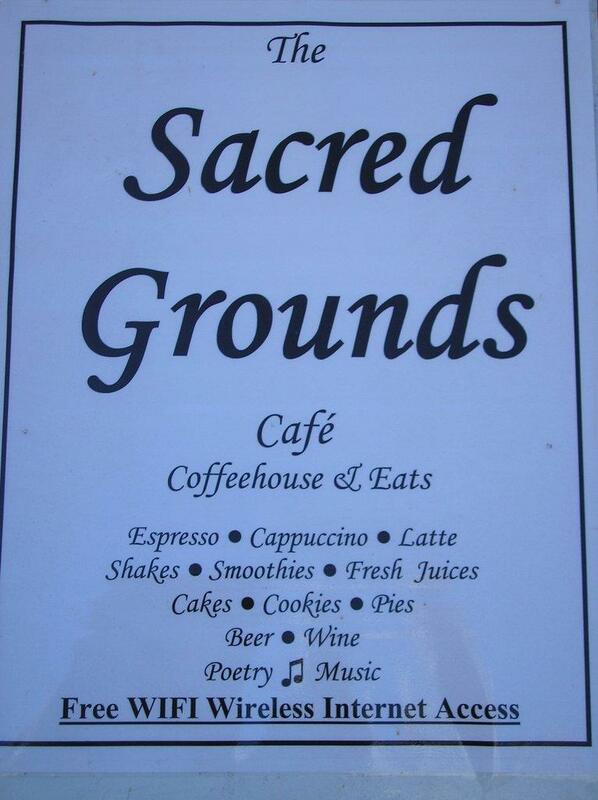 Jake Leland and Russ Blaine of IZUM played beautiful duetz and trioz to help raise money for 'families helping families', a non-profit based in Pineville, Lousiana, at The Sacred Grounds Cafe, in Community with A Thousand WordZ. At one point (right) Russ Blaine set his trumpet down and hopped on the community piano to play a couple of tunez. Jake Leland accompanied Somos ONE, of the Brown Buffalo Project, to a spoken word piece, written so elequantly by Somos. It waz great! I even jumped in with a little shaker of rice and beans to add a little flavor. Herez the Trio from left to right...Jake Leland, Russ Blaine and Special Guest 'Guillem of Spain'. The three brought unity through harmony and solo performances within collaborative songs. Jake Leland was the first brass piece to arrive and he showed up ready to play, as he strolled right in and played a couple of heart felt solos to fill The Sacred Grounds with his mellow and playful vibe of Tenor Sax. 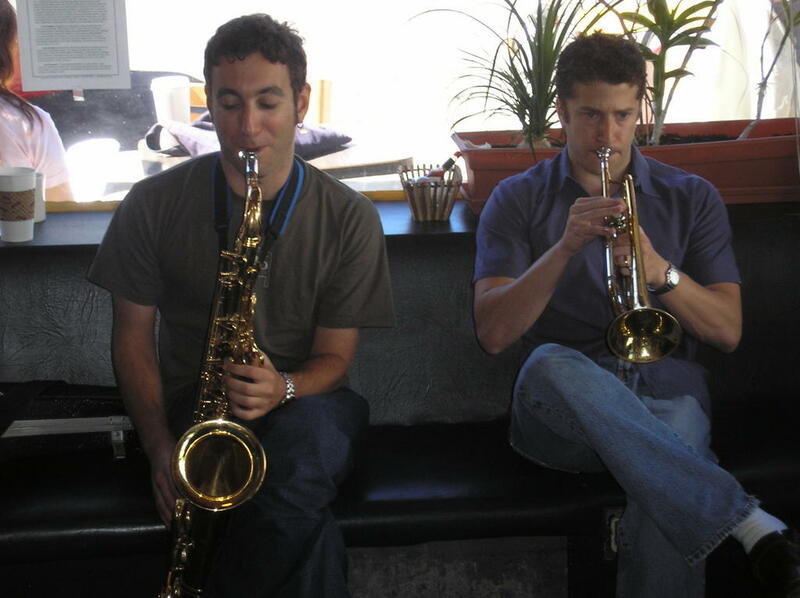 When Russ (trumpet) and Guillem (tenor sax) appeared the three collaborated on sharing the floor and combining their gifts for a cause worth more than any picture can be valued. (From left to right) Aharón Wheels Bolsta (Drums, flutes, tabla, calabash, darbukka, and sundry percussive palliatives) and JOHN ARNS (Sitar and Erhu) played very rich and enveloping sounds of India for the benefit. These two mesmorized everyone present with the lingering sounds of the sitar and the calabash. Their music continued to take me to dreamland. I felt the Sun pour into the room and everything stand still when they combined their gifts for the Hurricane Relief cause. It was definetly a beautiful day to hold such an event. el Brown Buffalo Project (BBP) delivered wordz on 'The Sacred Ground' that moved everyone. His passionate expression combined with his rythmic dance on wordz grabbed the audience by their heartz and mindz. He performed spoken word and served up a couple of hip hop jingles laced with conscious thoughts and reflective questions. A couple of the beautiful ladiez in the audience enjoying the great food of The Sacred Grounds Cafe and the performances. 2840 Military Hwy., Suite A. Please accept our donation of $100. 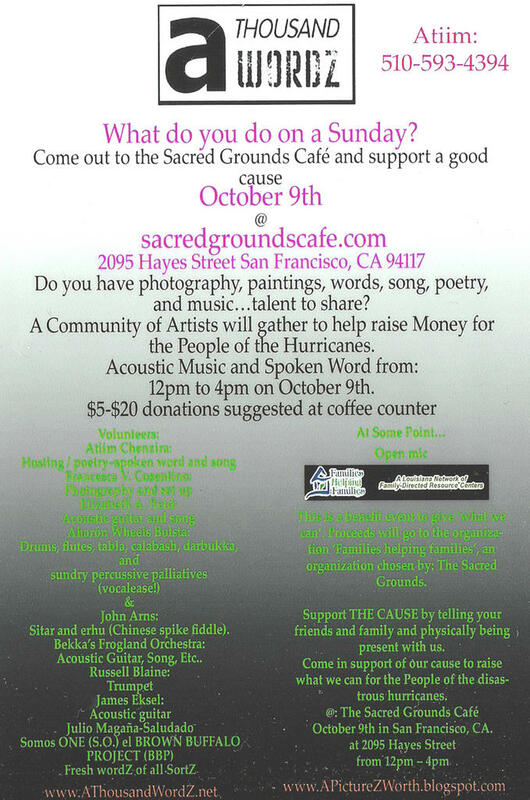 I’ve included a picture of the flyer and the people who participated in this fund raising event here at The Sacred Grounds Café. We send our love and support along with this modest donation. That's right...We didn't raise $2,300 like the event we did in North Berkeley on October 3rd, but every penny counts. However, Patrons of The Sacred Grounds Cafe were very generous. They wondered in off of the street and had their afternoon coffee. They read their papers and used the free community internet service. They sat down or stood still to listen to the wordz and/or the music being shared. Maybe they didn't even know they'd give money to help those traumatized by the floods of the broken levees or the disaster and headache of rebuilding for years to come, but they did. 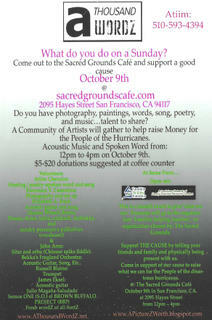 They particiapted in the community of 'The Sacred Grounds Cafe' and with A Thousand WordZ. The patrons of the cafe came for the amazing food and ambience and left hopeful with smiles on their faces. They signed our email list to join our community and left az members. Surrendering our expectations wasn't an easy task, but the end result wasn't about the amount of money raised or how many people showed up in support, it was about the amount of compassion we showed as a community. The fact is...we all came together as a community, whether we planned too or stumbled upon it happening, we showed solidarity by giving what we could to help our greater community in Louisiana. WE had a great time doing it too.